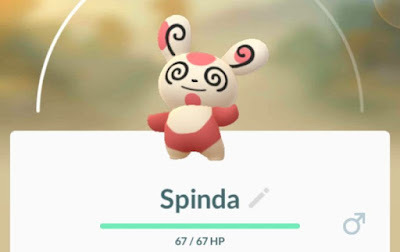 In Aug Pokemon Go you can not simply get Spinda while exploring but need to complete a field research which has been added in Aug-2018. Pokemon go spina is release on 01-Aug-2018 and is number 8 in the series. You can get this spinda as a reward for completing following fields search : “Make 3 Curveball Throws in a Row”. With a potential pattern in billion each spinda is intial Pokemon, now in Pokemon Go each Spinda isn't unique — there are "only" 8 patterns for everyone. Currently from field research you can only get Spinda number 8 only. But how do I find the Spinda Field Research? You get Field Research from spinning Poké Stops. Where each stop generates one Field Research task a day. So go out and spin as many Poké Stops as you can until you get one that rewards you with Spinda.